The Wiener Museum of Decorative Arts is only open one Saturday each month so don’t miss the next action-packed program on Saturday, February 23 from 11am to 4pm. 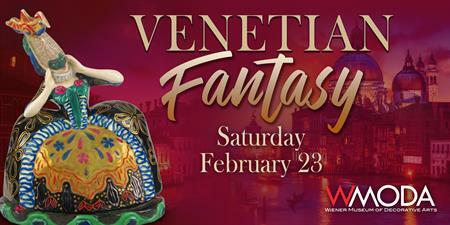 To celebrate the start of Carnival in Venice on February 23, we are hosting a VENETIAN FANTASY event for our next Sensational Saturday. The focus of our festivities is the magnificent Carnival in Venice tableau, which is the largest and most complex piece of porcelain art ever produced by Lladró. Matteo Montagner of Balocoloc Artisans will demonstrate the art of creating authentic hand-painted Venetian masks. Chelsea Rousso and her students will be showing off the stunning glass masks that they made at the WMODA workshop. Enjoy glass art by the Maestros of Murano in our Art on Fire Chihuly Connection exhibit. 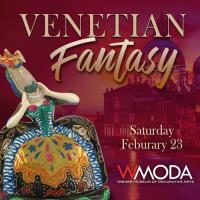 Come celebrate the art of having fun at our Venetian Fantasy event at WMODA. Venetian masks and costumes are encouraged! For more information, click HERE.